Diagnosing tree problems requires a combination of knowledge, experience and keen observation. Most often it is not simply a case of identifying an insect or disease. Trees that die or decline usually are suffering from a combination of stress factors and insects or diseases are often secondary, attacking the weakened tree. An arborist must learn to ask key questions about the history of the tree, environmental factors and age of the tree. Have there been any construction, excavations or chemical treatments in the area? 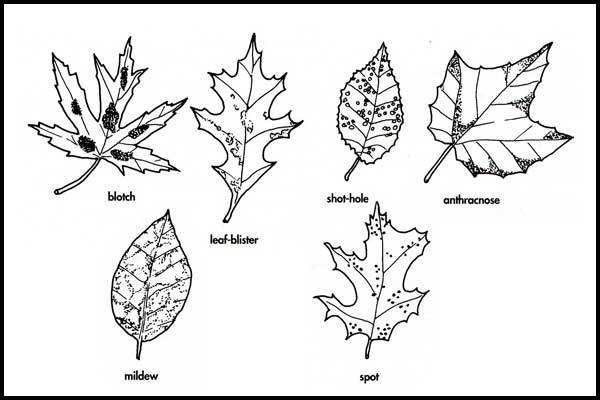 It is helpful to categorize plant health problems into two major groups - living and non-living. The living agents effecting a tree are fungi, bacteria, viruses, insects, mites and animals. These living agents are infectious because they can spread from tree to tree. The non-living factors such as temperature, extreme moisture, weather, mechanical injuries and mineral deficiencies effect the tree in different ways. Accurate diagnosis requires careful examination and a systematic process of elimination. For example, certain insects invade only certain types of trees. Knowing the tree can quickly limit the number of suspected causes. The foilage is invaribly the first part of the plant that most people notice. Changes and irregularities in the leaves tend to be easy to spot, and symptoms are often obvious. Dead leaves at the top of the tree are often the result of mechanical or environmental root stress, Twisted or curied leaves may indicate viral infection, insect feeching or exposure to herbicides. Uniform damage over a large area indicates nonliving factors such as physical injury, chemicals or weather. More clues can be found on the trunk, branches and twigs. Examine the trunk thoroughly for wounds because they provide entrances for canker and wood-rotting organisms and can disrupt the transport of materials between root and leaves. Small holes indicate the presence of borers or bark beetles. The root system is the most frequently overlooked portion of tree in the diagnosis process. This is unfortunate because the below-ground part of the tree is most often at the root of the problem. Stress caused by poor site conditions, bad planting practices, and human interference are often the culprits in poor tree health. Contact Early Piety if you would like to consult with an experienced arborist regarding the diagnosis of unhealthy trees which can lead to property damage and liability if not treated properly. A healthy tree is a beautiful tree and an asset to your property value - let Specialty Tree keep your trees alive and healthy.